Imagine being able to accept who we are - to never experience those moments of despair when we believe we will never be what we 'ought' to be. To never torment ourselves with accusations of why we are not thinner, more attractive, more popular, more witty, more successful, more...anything but who we are. Imagine being able to be oblivious of ourselves, to just live, taking on challenges and experiencing failures with equal aplomb. Imagine having unmitigated presence - when we walk into a room, we are noticed simply because we are radiating something everyone craves. Contentment. Acceptance. Peace. Imagine being able to embrace life and everything it has to offer; to leave our 'idealised' images behind and do what we believed we never could without first 'changing'. Imagine bounding into the world to embrace both success and failure knowing these experiences are just part of our unique experience of being alive, with none of it defining who we are. Imagine the wonderful feeling of being freed from the prison of how others perceive us, or in wasting time and energy on trying to impress. Our choice of garments would not define us, but complement us. We would only buy what we needed, no longer feeling subjected to the painful and costly addiction of 'want'. We would never look at a clever marketing campaign and believe lasting contentment can only be found by spending two weeks at an expensive beach house on the coast of Bali. We would no longer be possessed by our possessions. Rather, things would merely be bought to perform a function, not to represent who we wanted others to believe we were. 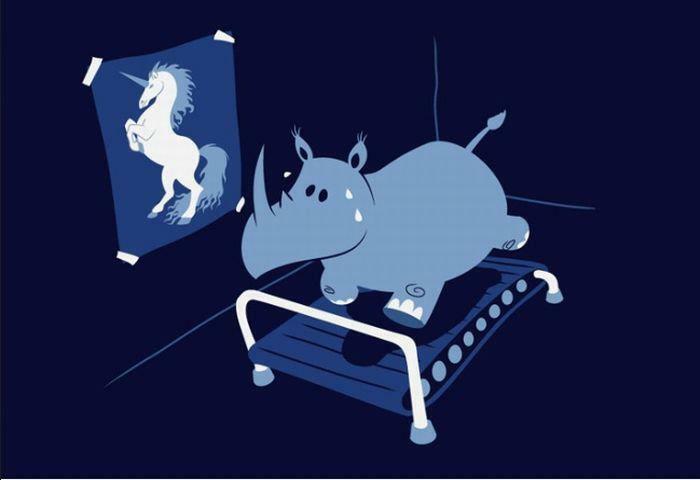 Unlike the photo above of the poor rhino trying to become a unicorn, we would know our Self and accept our Self, celebrating our strengths and embracing our weaknesses. We would know so long as we refuse to accept ourselves just as we are, we will never be able to truly enjoy life - or even know what we like or do not like with any certainty. We will have ripped down the image taped to the walls of our minds of who we are not and replaced it with an image of who we are - an honest, true, beautiful image of our Self in all our wonder. Each and every one of us are utterly unique with our own set of towering strengths and humbling weaknesses, and this uniqueness is what makes us amazing, interesting, and special. We are much more spectacular and complex than anything we could ever imagine we ought to be. When we rip away the image we have been holding in our mind's eye of who we should be and replace it with who we really are, we stop the cycle of torture, accusations, blame and self-hate against the wonderful person huddling deep inside of us that just wants to live.